This week we celebrated the first day of spring (hallelujah!) and the weather in Philadelphia, where the National Shrine of Saint Rita of Cascia resides, has been absolutely beautiful! I hope that the change in season is lifting your spirits, wherever you may be reading this blog! In this spirit, I thought that this week we could direct our focus to the story of a child who is bringing about extraordinary peace. We recently reflected on the organization Friends Without Borders and while their mission is carried out by children between India and Pakistan, that effort started through adults. Today’s featured peacemaker made waves as a child and has inspired other children to follow suit - proving to the rest of us that peace may be sought after at any time and any age. For those of you who are unaware about the state of affairs in Colombia, the country was engaged in a decades-long conflict between the Revolutionary Armed Forces of Colombia (FARC) guerrillas and the government. While the immediate conflict has ended, they are still tallying casualties due to the lingering presence of landmines: as of 2015, the Colombian government claimed that more than 11,000 people had been injured or killed by landmines since 1990. The death of one young girl served as a tipping point for Gerson Andres Florez Perez, who at the age of eleven decided that Colombia had endured enough. He wrote a peace proposal called “Children of Peace” and presented his work to the media and anyone willing to listen. Two million, seven hundred thousand children throughout Colombia gave their vote in a referendum and demanded the respect of their fundamental rights, and all because Gerson decided to write this proposal. This mobilization became known as the “Children’s Movement for Peace” and sparked the most important referendum by civil society for life and liberty. 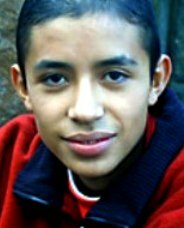 Gerson was awarded the 1999 Global Youth Award for Peace and Tolerance. At the age of sixteen, he also became the youngest law student at The Universidad Nueva Granada and in time won a Nobel Peace Prize for the work he did to reduce personal landmines. Gerson not only discovered he had a voice, but that his voice could become a wildly powerful vehicle for peace. Age, education, status - none of theoe factors prevailed over his innate, God-given abilities to create change. May his example bring you renewed hope and I pray that your hearts are open to receive the hope springing all around you! Older Post"Woman with my Sleeves Rolled Up"